What’s a trip to Southern California without making a stop at the happiest place on earth: Disneyland. Last week we took a road trip to San Clemente for a memorial service for my Grandma who passed away last month. On the way back we decided to inject some fun for the kids into the trip with a visit to the ultimate theme park. I was a bit worried that with it being mid-summer and a weekend that the crowds would be insane and wait times unbearable. But it was exactly the opposite. Some of the more popular rides like Splash Mountain, Indiana Jones and the Nemo Submarines had lines with wait times of 45 minutes but most everything else was less than 15 minutes. We rode the Matterhorn Bobsleds and Big Thunder Railroad. In fact my youngest son (pictured here) loved Big Thunder Railroad so much that we went on it twice! I was thankful that he just made the height requirement. We only had a day to spend in the park and there is really no way yo can see and do everything. We picked the things we thought the kids would really enjoy and just had a great time. We stayed until closing and enjoyed one of the most spectacular fireworks show you will ever see. Just a great time with the kids. When we got back to the hotel room the kids were so worn out they fell asleep in about 15 seconds. By the way, if you are looking for a decent hotel that is located close to the park we have enjoyed the Portofino Inn & Suites the two times we have stayed there. They have a kids suite that is really nice. And it’s only a 10 minute walk to the park entrance. 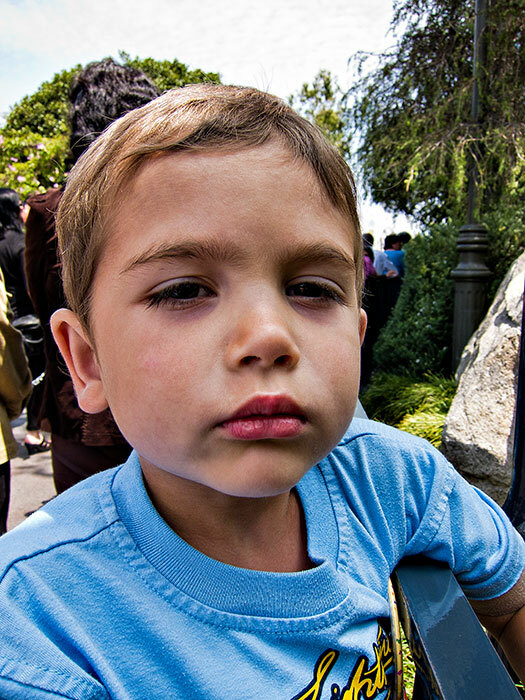 This photo was taken while waiting in line to get on the Matterhorn Bobsleds. My son doesn’t look like he has much patience here but he did really well all day long.